Size of Black Kite with long wings and tail, kinked wing position when gliding and flexible wing-beats; soars on highly raised wings. 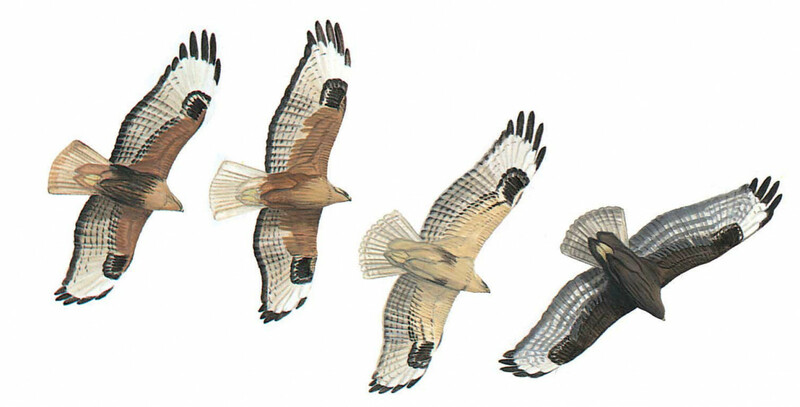 Wide plumage variation: creamy white, rufous-brown and blackish forms on account of colour on body and underwing-coverts. The blackish form can show coarse dark bars on flight- and tail-feathers. Many Long-legged (except dark birds) have very pale head and breast darkening towards belly, pale sandy or rufous-brown upperwing-coverts contrasting with flight-feathers, unbarred pale rusty-orange uppertail (appearing very pale at distance); large black carpal-patches usually distinctive. Juvenile has finely barred outer tail and diffuse dark trailing edge to underwings (usually clear-cut in adult); some are almost white below with bold carpal-patches and dark rusty brown belly (sometimes sides only). Soars and hovers in search of prey.